Call your Milton Avery–loving friends and grab a plane, train, or automobile to Miami. (If you don’t have any, just grab some friends and do the same: it’s time to make converts.) The late, great painter and once-in-a-generation colorist, who died in 1965 at the age of 79, is one of the stars of this year’s edition of Art Basel Miami Beach. 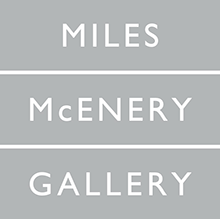 No fewer than five galleries are presenting his works at the fair, where at least 10 works by the severely underrated American painter are hanging at the moment. Avery spent much of his career in New York, and dealers from the city have brought some major work. 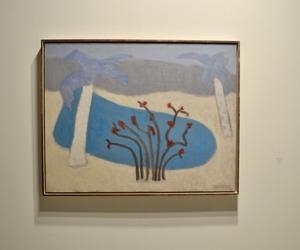 Ameringer McEnery Yohe has the most topical piece, a 1953 stunner called Florida Lake, with its lush blues and grays set off against a sandy ground. Hirschl & Adler has a wild portrait of a man in a striped shirt and a bright green face, a hill dotted with quick little trees exploding behind him. Paul Kasmin has a quartet of spare works, three with birds out in the wild, standing or flying free. And Menconi + Schoelkopf has one with a trio of birds standing on a pink beach before an undulating landscape of white and spearmint; it resembles a hunk of Neapolitan ice cream.